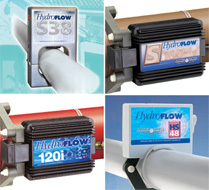 HYDROFLOW USA offers a manufacturer-backed, one-year “Fit for Purpose Guarantee.” If, within 12 months of the date of purchase, after correct installation, there has been no measurable improvement in the application for which the Product was installed, HYDROFLOW USA will refund 100% of the purchase price. HYDROFLOW USA offers a manufacturer-backed, three-year limited warranty against failure or defects in the Product or its component parts. If the Product or any part fails during the first three years of operation (e.g. the red light stops glowing), and the failure is not caused by improper installation, physical damage to the Product caused by the customer or installer, misuse, act of God, terrorism or sabotage, HYDROFLOW will repair or replace the Product free of charge. HYDROFLOW USA accepts no responsibility for water leaks or damage caused by the removal of limescale. This three-year limited warranty is not valid without a surge protection device of adequate quality to protect components. Refer to your Product Warranty Card for full details. Extended warranty options may be available through your dealer. Extensive testing has proven EnduroShield to last beyond 10 years, enabling a genuine 10-year warranty on all new glass surfaces. A three-year warranty is provided for application to existing glass surfaces, however this does not infer that the coating will stop working after this period. PCT Global LLC warrants that EnduroShield® will remain water repellent for a period of ten years from the date of the receipt provided by your dealer. Conditions: EnduroShield must be professionally applied to new glass and prior to the glass coming into contact with any contaminants. EnduroShield must be applied and maintained as per manufacturer’s instructions to validate and maintain the warranty. This Limited Warranty is for the EnduroShield protective coating, not the glass or any other components. If, within the warranty period, you feel that your glass is no longer easy to clean, please send an e-mail to serviceusa@enduroshield.com and provide a brief explanation of the problem, along with your name, address, telephone number and the date EnduroShield was applied. This Limited Warranty is void if the EnduroShield protective coating is damaged by accident, improper use, or a failure to follow recommended cleaning instructions. Visit http://www.enduroshieldusa.com/care-instructions for detailed care instructions. If it is determined that an area that has been correctly treated has not remained water repellent, PCT Global LLC, will gladly arrange replacement EnduroShield for Glass to re-coat the area that is deemed to be unprotected. PCT Global LLC reserves the right to inspect the glass in order to determine that the product has been applied and maintained in a manner consistent with the manufacturer’s instructions.